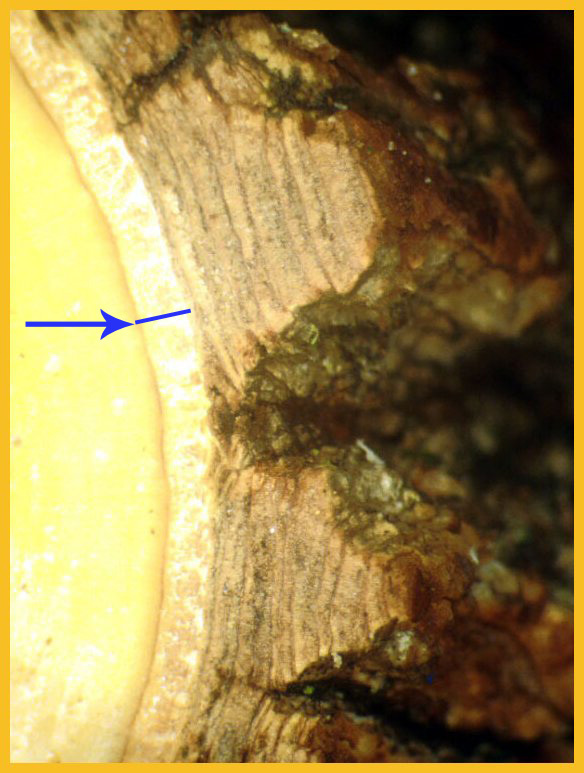 Inner Bark (phloem) - In trees, the phloem is the orderly arrangement of living, aging, dying, and dead cells on the outer side of the vascular cambium and inner side of the phellogen or bark cambium. Phloem, or inner bark, is a transport tissue. It transports energy-containing substances made in leaves toward non-woody absorbing roots or the sink. The phloem is produced by the cambium zone. The phloem contains a symplast. I have learned, some trees store starch in the phloem such as black locust (robinia). I have learned, most species that have resign ducts, only have them in the wood, but, there are some such as Blue Atlas Cedrus, that form them in the phloem. You have early phloem and late phloem. In many trees you can count the age of the tree, if you are very very careful by counting the increments in the phloem. Instead of vessels there are sieve tubes, and they are surrounded by companion cells.